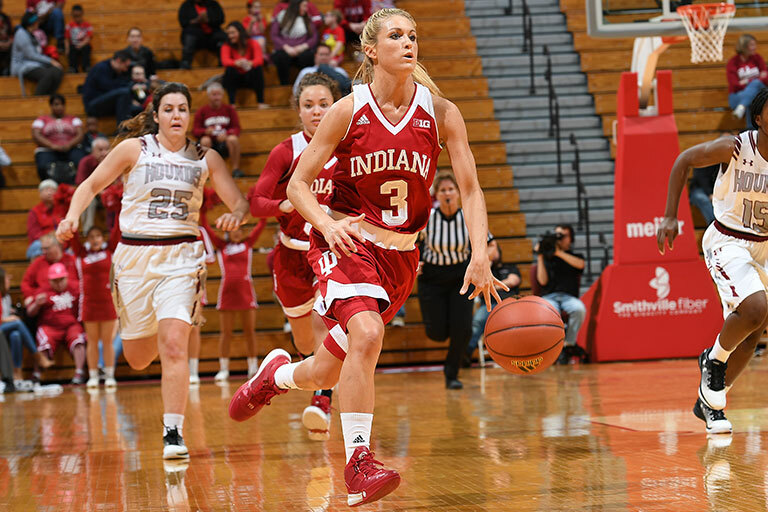 Ask IU junior Tyra Buss what she likes to do in her free time and the laser-focused point guard for the IU women’s basketball team has a hard time coming up with something. In fact, when she wants to relax, Buss goes right back to the court. "I shoot," said the physical education major. "If I'm having a bad day and need to clear my head, I put on my headphones, turn on some music and shoot." Growing up in Mount Carmel, Illinois, two things were prominent in Buss' life: academics and athletics. Her mom ran track in college and is a high school physical education teacher; her dad is a school superintendent. She has two older brothers; the oldest is a physical education and health teacher and coaches high school basketball; the other brother is a physical education teacher and coaches high school football. So it's no surprise that Buss grew up participating in sports -- basketball, track, tennis and cross country -- and focusing heavily on academic achievement. "Ever since I was little, and all throughout school, my parents always told me academics are the most important thing," she said. "There will be life after sports, so my mom and dad pushed me to study hard and to get good grades." That push to maintain a good balance between athletics and academics has served Buss well in college. She earned All-Big Ten first team honors in 2015-16 -- the first IU player to earn first team distinction since 2006 -- and made All-Big Ten academic selection that same year. Buss poses outside of the IU School of Public Health-Bloomington where she has many of her classes. Photo by IU Communications. But in many ways, Buss is like most typical college students; her days are filled with classes, studying for exams and having dinner with friends. But as a student athlete -- especially a high-profile athlete -- Buss' college experience, like her high school experience, is a little different. In addition to classes and maintaining a social life, Buss is busy with practice, training, traveling to games and media interviews. 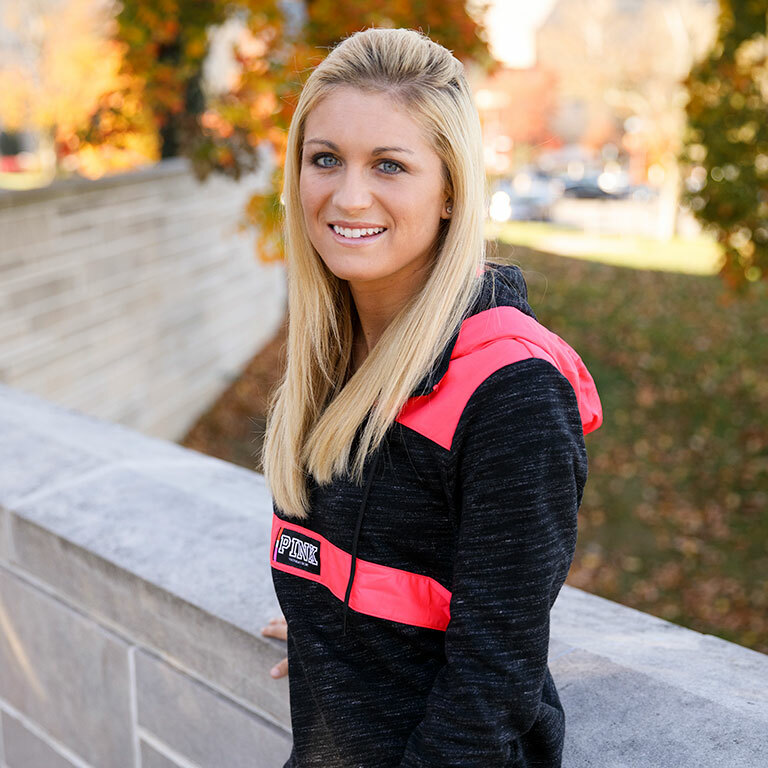 A superstar in women's basketball before she ever came to IU, Buss has learned not to let the outside noise affect her. "I don't worry what people say about me, especially when it’s negative," she said. "I focus on what I can control: working hard and having a good work ethic. And when people do say something negative, it just motivates me to work harder." Competitive by nature, Buss said it is the love of the game and the desire to always improve that drive her. Although the spotlight has been shining on her most of her life, Buss said she isn’t comfortable with being in the limelight. "I don't really like attention that much," she said. "I do get a lot, especially now, but I don't really like it. My parents always told me to stay humble, and that's what I've done. I don’t like talking about myself or drawing attention to myself. I just play basketball." When you reach 1,000 points at the start of your junior year -- making you the first IU women's basketball player to do so -- it is hard to avoid attention. But one of the reasons Buss loves basketball is because it is a team sport. So when people want to highlight the fact that she has scored the most points by an IU player in the first two seasons played, or set a record for the most free throws made in a single year, Buss is quick to make the spotlight wider. "I don't like to talk about my individual honors, and I don't really like when people mention how many points I made," she said. "It is about the team. I wouldn't have those individual honors without my team." Those teammates are one of the best parts of Buss' experience. It was the team camaraderie that solidified Buss' desires to come to IU Bloomington. Whether it's between the lines of the basketball court, in the classroom or outside the game, the women's team is more than just a team, Buss said; they are family. "It is about the team," Buss said. "I wouldn't have those individual honors without my team." Photo courtesy of IU Athletics. "We are sisters and we trust each other, and we have each other's backs," she said. "One of the reasons for our success is the chemistry we have and that tight bond we have together. No matter what, we are a family and we stick together." Family is important to Buss. Her two brothers did pick on her, as brothers sometimes do. But they always included her in their activities, motivated her to keep pushing herself to work hard and reminded her to always have fun. When Buss began playing basketball, her brothers were there before every game to give her words of encouragement, a pre-game ritual they still do today. When asked who she looks up to, an emotional Buss points to the two men who have been there for her all her life. "I've always looked up to my brothers," she said. "They always were protective of me and had my back. When anyone said anything bad about me, they would tell me not to worry about it, and they would protect me. When I get knocked down and I get back up, that is accredited to them. "I want to make my parents and brothers really proud. They shaped me into the person I am today." Buss also tries to spread that message to the young people, especially the young girls, who look up to her as an athlete. Being a positive role model for young people is one of the reasons Buss majored in physical education and why she hopes to one day become an educator and a coach, just like her family. "I like working with kids and letting them know you can do anything you put your mind to," she said. "That's what my parents have always told me, and that's what's in my heart. I truly believe that, so I like motivating kids to do well and let them know they can do anything they set their minds to."